1-CD with 8-page booklet, 16 tracks. Playing time approx. 40 minutes. On 23 December 2001, Angèle Durand, a chanson singer who sang herself into the hearts of many fans of this genre with a dark, unmistakable voice in the 1950s and 1960s, died. Durand was born on 23 October 1925 in Antwerp, Belgium, came to boarding school and had her first successes as an amateur singer in radio broadcasts, among others at the US station AFN. It was discovered in 1950 by the US bandleader Duke Ellington. The jazz player took Durand on tour through Europe. After a concert in Hamburg she met Nils Nobach. He became their producer and a relationship developed privately - they got married in 1958. 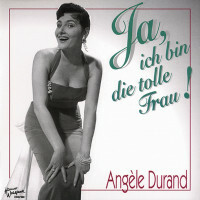 German music film could not get past Angèle Durand, the singer with the exciting figure and the attractive voice could be seen or heard in 15 strips. In the world-famous Tivoli amusement park in Copenhagen in 1957, she was one of the stars of the summer programme alongside the French charmer Maurice Chevalier. Tours throughout Europe with stars such as Peter Kreuder, René Carol, Rudi Schuricke and Liselotte Malkowsky followed. In October 1961 Nobach and Durand separated, Lou van Burg became the new man in their lives. She gave up her career for him and worked as his manager. In 1975 Durand appeared on stage as an actress at the Schleswig-Holsteinisches Landestheater in the world premiere of the Peter Kreuder musical'Wedding Mary'. Acting, musical theatre and soon cabaret were not to be let go. In Gelsenkirchen she appeared in Peter Kreuder's'Madame Scandaleuse', Georg Kreisler's'Das Glas Wasser' and in her favourite role, the gold in'Anatevka'. In 1984, also in Gelsenkirchen, she set the unforgotten Claire Waldoff a musical monument with a highly regarded stage program (BCD 16006). In Paris she was successful as Mrs. Peachum in the'Threepenny Opera'. For her 50th stage anniversary in 1990 she surprised with a new single: Paths that lead through life. Westdeutscher Rundfunk engaged her several times for the moderation of the Rheinische Musiktage in Aachen. Yes, I am the great woman), was about to start rehearsals for'Der Vetter aus Dingsda' in Augsburg in December 2001, when she fell ill. One day before Christmas Eve, her voice went silent forever. The dress was secretly borrowed by her aunt, and Angèle Durand was barely fifteen when she sneaked into it for a youth competition in her hometown of Antwerp. The use had consequences, she landed on the second place, won with it a lady bicycle, and from the aunt it put slaps in the face because of the dress. That was incentive enough, the little one went on, wanted only one more thing: to sing. She already knew how this went from her family, because her grandmother was a well-known Wagner singer. Angèle Durand was more into jazz songs and appeared on stage with Duke Ellington's Bye-bye Blues. Thus she was discovered for a revue, and incidentally she stood in front of the microphones of Flemish radio, for children's songs in which she sang songs that were actually written for boys. A boy has been lost to me,' says Angèle Durand today when she talks about the past. I may not miss all the memories,' for one thing she has learned in the process:'I have never said: I cannot do that'. The many small appearances at a young age were the best exercise for the big tasks that followed. From Radio Brussels she came to AFN and sang the current American hits up and down in the daily programme'What's new? Shortly after the end of the war, she toured Europe for the first time. Duke Ellington became aware of her in Brussels in 1950 and engaged her for his tour of Western Europe. So she came to Germany, first stayed with Hessischer Rundfunk in Frankfurt and finally came to NWDR in Hamburg. In the end, as a Belgian, she needed a residence permit for her engagements, which had to be renewed every six weeks. to learn.' she remembers. The German language does not cause her any difficulties, the Flemish language of her homeland is not so far from it. To the B-side of her first shellac record Angäle Durand comes by chance. When she recovers from her first recording in the NWDR canteen, she talks to Lotte Lenya, who is sitting at the next table. The Brecht interpreter and widow of composer Kurt Weill proposes a piece by her husband, the September song. 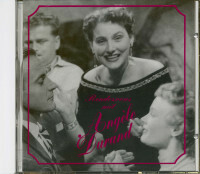 The first record, When Mademoiselle Kisses You, goes down well with the radio stations, the film'Under the Sky of Paris', in which the song is played, is the best promotion for it. The title runs so well that a French version of it is also recorded. 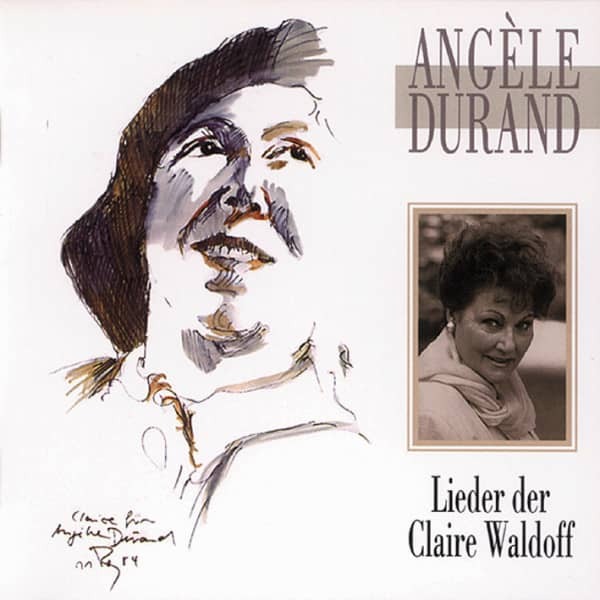 Customer evaluation for "Lieder der Claire Waldoff"